I’m currently driving (well riding) from Massachusetts to Kentucky with my family of 5. One child has the stomach bug, another an on going troublesome tummy, and one acting as the screen time policeman. Not to mention the roads are notoriously bad as the weather has turned to a wet wintry mix. We’ve passed several cars either in the median or in a ditch. I’m a bundle of nerves and worry as I fear a possible accident and the rest of falling ill to the same virus as my daughter, all 2 days before Christmas. 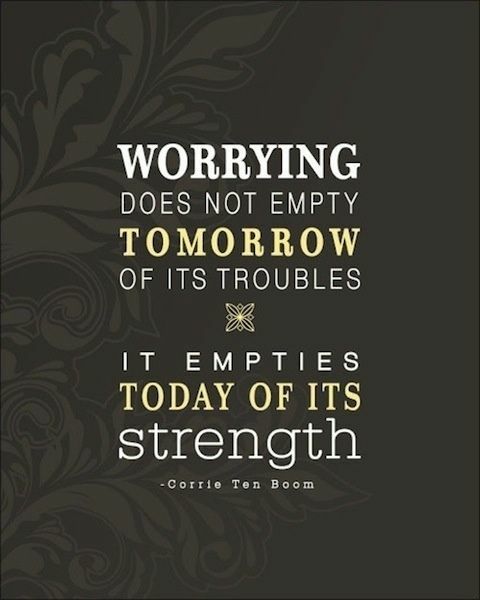 As I have the time to contemplate my worry now as well as in the past, I’ve realized worry takes a toll on my mind, body, and soul. In the evening after tucking all 3 kids in bed, I collapse on the couch physically and mentally exhausted all from the compounding worries of the day. I worry about parenting–am I doing more harm than good, are my kids safe, am I giving each child enough time, is my discipline appropriate, how are my kids self-esteems, am I teaching them life skills and moral truths? I worry about my own identity—where do I belong, am I a good friend, will I always be a stay at home mom, who will I be in 5 years? I worry about my marriage—do I give my partner enough quality time, will we stand the test of time, do I share my love and kindness with him? All these worries lead to one question—AM I ENOUGH? I know I’m not alone in this feeling or worry. You see quotes all over Pinterest and Instagram referring to being enough. There are a slew of blog posts on the very subject. I even have a t-shirt that Annie gave me and it reads, “I am me and that is enough.” So why do we constantly fight this ideal of what enough is and where does it come from? I know for me, as an obliger and perfectionist, I fight the comparison battle and look for a standard to set myself against. What should my parenting look like? What should my identity be? Where should my marriage be at 11 years? Its difficult to defeat this mentality as I strive for a sense of measuring up to something, anything. Yet, this need for “being enough” is wearing me out, leaving my soul empty. Instead, I need to be gentler to myself and embrace the truth that what I am giving is enough for me. In reality the only one that really matters is knowing that I gave what I could at the end of the day. There is no ideal, it’s a myth. What we are able to give each day to our kids, marriage, and friends is good enough. Yes, there will be those horrible, terrible, no good, very bad days. But even on those days, we can end the day saying I did give what I could, it was good enough. I dressed my kids, packed a lunch, kissed them good bye, hugged my partner, and showed compassion to others—it was good enough. I brought store made cookies to a church function, I let the kids watch a movie after school, I bought McDonalds for dinner tonight—it was good enough. I don’t always have to make everything homemade, I don’t always have to plan an afterschool craft or learning activity, I don’t always have to discipline every child behavior infraction. I am doing my best and that should be and is the only thing that is important. As I try to remember this in the moment, I hope it will alleviate my worry and the resulting exhaustion. I want to take back my mind in 2018 and truly embrace my good enough philosophy.